For centuries the book has been vitally important to the church. No words can describe the stunning beauty and extreme splendour of the Book of Kells. It is an artistic celebration of God and the word of God recording for us the Irish people’s prayerful engagement with the Divine. The artist’s book has become a developed art form in the last 100 years and has evolved in many directions. These books have been created as original works of art and push the boundaries of traditional book forms. A natural progression for an artist whose art has celebrated how the written word (particularly the languages of the Bible) has deeply enriched culture, would be to eventually use the book itself as a format for expression as has been the case in my own work. I have always been fascinated by how written language allows us to share thoughts and ideas across the boundaries of time and place. But even more amazing is that God has chosen to use the word to communicate with people. My most recent works use actual books that are fixed open and finished to display a variety of surfaces including raised Hebrew and Greek texts. The face of Resurrection Book contains the Greek passage from the 24th chapter of Luke, which recounts the story of the Resurrection. The text was created as a collagraph using an etching press, glued to the face of the book, painted a deep earthly clay red, covered with gold leaf and then a final application of iridescent oil crayon was applied to the surface. The luminous surface of the book recalls the cascading light of Christ’s Resurrection that reaches deep into the heart of those who believe. 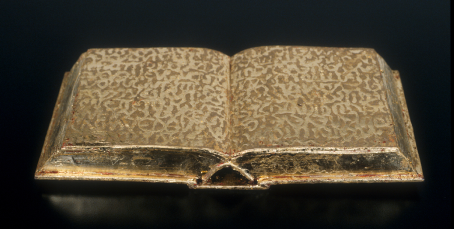 Sandra Bowden, Resurrection Book, 2004, mixed media with gold leaf, 5.25 x 11.75 x 1.5 inches. Sandra Bowden is a painter and printmaker living in Chatham, MA. In 2005 Square Halo published The Art of Sandra Bowden. With over 100 one-person shows, her work is in many collections including the Vatican Museum of Contemporary Religious Art in Rome, the Museum of Biblical Art in NYC, and the Haifa Museum in Israel. Sandra was president of Christians in the Visual Arts from 1993-2007 and has curated many exhibitions and coordinated the CIVA exhibitions program since its inception. She is a founding member and Vice Chair of the Museum of Biblical Art in New York City. She studied at Massachusetts College of Art and received her BA from the State University of New York. For more on her and her art, go to www.sandrabowden.com.